I could just simply say 'run don't walk', and go buy Gran Dovejo Tequila, but let me take some time to explain why. Besides being produced at one of the best, and well regarded distilleries in operation, at Feliciano Vivancos y Asociados- NOM 1414 in the Los Altos region of Jalisco, this tequila is made the right way.... right from the start. Creator Frank Mendez told me "our goal has always been to create something that expresses what can be produced, when every person behind a product shares the same passion for the craft and spirit." Mendez said that "brand owners need to be, and work with a distillery who shares the same passion, but unfortunately this is not usually the case." I can surely agree with that, and at the first sip of both of these blancos, you're going to see why this tequila brand is so special. Gran Dovejo is a handcrafted tequila that is made with single estate Los Altos ripened agaves, from the Feliciano's El Ranchito in Arandas. These selected agaves are cooked in a Horno (brick oven), fermented with champagne yeast and double distilled in all copper pot stills, and created in small batches. Those of you that know great production procedures, know that this is about as good as it can get. Frank Mendez was the founder and owner of Gran Dovejo/Mendez Imports along with his cousin, but recently Mendez alone, has teamed up with Salvador Chavez, who is the CEO and Owner of Puente international. Frank, his wife Leticia, and Gran Dovejo have merged with Salvador Chavez, who owns a line of 'Charanda' Rum and Mezcals, to run Puente International together. These guys have been available to me full time, and are eager, enthusiastic, and intelligent, and always have an explanation. Concerning their products and production practices..... they are 100% transparent and I could feel the compassion from both of them. They produce two blancos- a 40% abv and a 49% (98 proof), and both are as good as it gets, and I could drink these blancos along with a small handful of others, for my remaining days. They are simply incredible!! BELOW- Owners- Salvador Chavez (on left) and Frank Mendez (on right) are involved in many civic and educational contributions in Sonoma, California as well as communities where the spirits are crafted in Mexico. As mentioned in my 'additive-free brands' article, Frank Mendez made it clear that they use absolutely NO additives, not even the allowed 1%. He told me, "in fact- additives and the misleading way they are used, is exactly why he created Gran Dovejo. My friend Grover Sanschagrin of 'Taste Tequila' said "Frank isn't just another tequila brand owner, he's a full-blown tequila nerd, and that's what makes his products so special. The industry needs more people like him, who are fans of the spirit first, and a brand owner second. He likes to drink tequilas other than his own, and I think this makes a big difference in the quality of Gran Dovejo, because he knows exactly what he would want as a consumer." This tequila line is very clean and pure, and all the expressions have won numerous awards (SEE BELOW). Keep in mind that Gran Dovejo has just won a Silver Medal with the High proof Blanco and Anejo, as well as 'Best in Category' for the Reposado, in The 2017 Spirits of Mexico Awards. I search out quality tequilas like this, and I have moved this amazing tasting and additive-free tequila way up, on my 'Long Island Lou's Best Blanco Tequilas' List. This brand and especially these blancos, either the 40% abv or the high proof, deserve recognition as some of the world's best blanco tequilas. These naturally sweet and pure tasting blancos are simply unbelievable. I promise you that you can taste every blanco in the world, and if you can appreciate a clean, pure, natural taste, you will realize that these are some of the finest blancos made anywhere. They are absolutely exceptional, and if you have agreed with any of my previous reviews and articles, you MUST try these. I only want to drink the best blancos and aged tequilas, and it really doesnt get any better than Gran Dovejo. When I am not reviewing a product, THIS is a tequila that I drink, and will continue to drink for my pleasure. The buttery silkiness and clean and pure profile is really unbelievable. The aged tequilas are exceptional as well, and if I had to pick a favorite it would be the Reposado, which is light and full of butter and agave pureness. Salvador Chavez told me that "the natural flavors of the aging come from barreling at lower abv (43%) and strong presence of agave is due to distilling to 49%". Distilling to this proof is specific to Gran Dovejo, as it expresses a pure agave flavor. This means that Gran Dovejo is distilled to 49% but brought down to 43% to barrel/age to achieve this amazing flavor profile, although most other producers will age at a higher proof and reduce (water down) after aging. Why water down an aged spirit that took so long to develop, after aging and before bottling? Mendez said it's his belief that aging at lower proof, allows for a different type of flavor and compounds, to integrate into the spirit, and by having to reduce with less water for final proof, ensures that most of the flavors will be balanced, versus bringing down a product that has aged at a lot higher proof. Sergio Cruz- is the Master Distiller of NOM 1414, and had worked alongside original Master Distiller-Leopoldo Solis Tinoco, and both master distillers work and ideas have ultimately contributed to GD's profile. Just back from visiting Sergio Cruz at the distillery, Chavez said that "Cruz simply waits for the right "eureka, it's ready" kind of moment, concerning the perfect aroma, flavor and viscosity. Chavez can't rave enough about Sergio Cruz and his detailed work, like dealing with the fussil oils (the oily and greasy waxes and fats that come naturally from the agave plant, to protect itself from the sun) by removing the 'bad honeys' and how he uses the 'good honeys' etc. This has to be properly dealt with, especially concerning the two blanco presentations, as both a lower abv and a higher abv need to have the same characteristics, except for the alcohol level itself. Salvador Chavez mentioned "from what I gathered as a conclusion, Sergio does everything to achieve a profile... a desirable profile." 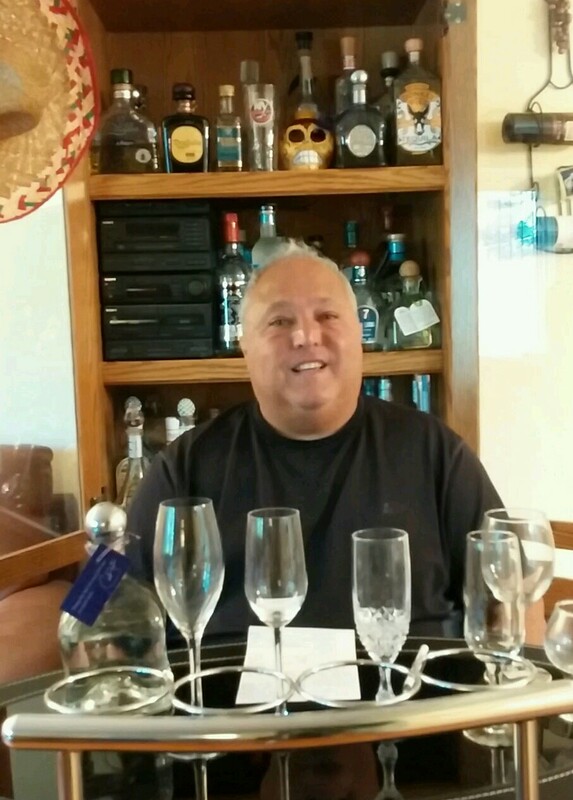 Sergio Cruz is not only Gran Dovejo's Master Distiller, but also an instructor/professor at the university level, for tequila chemistry/production. These guys have a great team, a fantastic distillery, creative ideas and amazing future plans..... and we get to benefit from them all. I asked the owners where the heavy oaky/wood/caramel taste in the anejo was coming from, since the barrels are used, the color is relatively light and not aged extremely long, and no additives are used? I wondered if it was in the charring, and Mendez mentioned that "yes it's from various levels of charring and flavors from the 'lower' abv at the time of entry, into the barrels." I asked for an explanation, and he explained that lower proof level allows for the sugars in the charred wood to dissolve more readily into the tequila, as it cycles in and out of the barrel, along with other flavors from the re-charred barrel, which all contribute to this profile. Makes sense if you think about it. Chavez joined in mentioning that the "oakiness" comes from the recharring, and the caramel and vanilla sweet flavors come through, from choosing to enter the barrel at a low abv. These owners are completely open to questions, are very hands-on, and are fully immersed in their products, and that's so refreshing to see. They truly want to make the best product possible. Frank Mendez said "our goal, because of our passion for tequila, had always been to work with a team that is as passionate about the craft and spirit as we are, and not just offer the same tequila in a different bottle." I agree that many brand owners are focusing more on the bottle than the juice, but that kind of thinking isn't even in their realm of thought. Being a 'Lou's Top Tequila' please see Gran Dovejo's logo on the side of this page, click and visit Gran Dovejo's website. PRODUCTION- Extremely ripe agaves are used from single estate fields owned by the Vivanco family, brick hornos are used for cooking for a minimum of 36 hours at an average temperature of 194 degree Fahrenheit. Shredder/roller milling then takes place followed by stainless steel fermentation with Prise de Mousse Champagne yeast, and classical music playing, which is known as 'The Mozart Method'. This is followed by double distillation in all copper stills. BLANCO (40% abv/80 pr)- At about $44.99 a bottle and doubled distilled, this crystal clear, clean and crisp blanco is absolutely amazing, with undeniably sweet and 'naturally' sugary aromas, with cooked and bright green fresh agave, so buttery, clean and silky with delicious notes of fruit, pepper, citrus, anise, honey and light smoke. Vegetal and green, with some alcohol presence, earthy and minerally. This 80 proof has a sweeter nose than the 96 proof, and if I had to pick one of these blancos, I think the extra butter, the softness and silkiness along with more flavors, give this 80 proof a 'slight edge'. In the mouth it has a nice oiliness, lots of sweet agave, light pepper, citrus, mint, earth, anise, some olive brine, and a gentle finish. This blanco is bottled right after distillation......just like it should be. NOSE- very sweet cooked agave, minerals, anise (licorice), light spice and some pepper, honey, light smoke, floral and so buttery with some fruit, citrus and vegetal, with some alcohol, a pinch of cinnamon, herbal, spearmint and olive brine. Clean, fresh, pure natural aromas here. TASTE- medium to thick oils, sweet cooked agave, light smoke, herbal, olive brine, anise (licorice), buttery, pepper, mint, with light spice, soft, and so smooth and silky. Delicious notes of floral and citrus, with a pinch of alcohol heat. FINISH- buttery with light spice and pepper, some mint, very smooth and silky, with anise (licorice), and naturally sweet. Some smoke, so clean and fresh, and ending in a medium/long finish. BLANCO (49% abv/98 pr)- At about $49.99 a bottle and doubled distilled, this blanco is naturally hotter with the higher alcohol level, but with sweet buttery cooked agave aromas. Not hot like some 110 proofs, and so easy and enjoyable to sip. Aromas of natural sweet agave, butter (but not as much as the 40% abv), some alcohol, only a pinch of mint, pepper and spice, light smoke and a pinch of cinnamon. An earthy, grassy, fruity- melon/pineapple presence, with some slight anise and some citrus. Gran Dovejo High Proof Blanco is distilled to 49% abv before bottling, without water. This high proof blanco is one of the best you can possibly buy, is a world class sipper and at the same time would make an amazing high end cocktail. The notes here are all about cooked agave with earthy, buttery, fruity and spicy aromas, and cooked agave, butter, mint, fruit, spice, and anise (licorice) tastes. An excellent bright and and rich high proof blanco. NOSE- sweet cooked agave, butter, earthy aroma like wet clay, grassy, some mint and fruit (melon or pineapple). Herbal with some light spice, a pinch of mint and cinnamon, some anise (licorice) and a little floral. Black pepper with some light smoke, and some alcohol. **TASTE-**medium to thick oils, some butter, sweet agave, and silky with light mint, cinnamon and light spice. A slight bite with some floral and some fruit presence. A clean and refreshing mouthfeel, with a nice bite. FINISH- buttery with light spice, some cinnamon, and silky. Some mint and pepper along with some fruit, and ending in a medium to long finish. REPOSADO- At about $49.99 a bottle and doubled distilled, this Reposado is distilled to 49% abv/98 proof, then reduced with artisanal well water, and placed in lightly re-charred used American white oak bourbon barrels, and aged for 6 to 9 months. The aging varies, as it's considered done, when Master Distiller Sergio Cruz feels it's ready. Aging at lower abv levels, yields more naturally sweeter vanilla and caramel notes. This lightly colored Reposado just placed 'Best in Class' in the 2017 SOM 'Blind Competition', which doesn't surprise me. I love this Reposado, and it's now one of my favorites of all brands Reposado's on the market, with delicious aromas of butter, minerals (wet stones), sweet agave, a pinch of mint and cinnamon, light anise (licorice), light smoke, light spice and a pinch of caramel and butterscotch with just a touch of oak and a whiskey/bourbon presence. Taste is buttery silkiness, pure and natural sugary sweetness, fresh clean minerals, slight smoke, some heat, oak with some spice, and a touch of butterscotch and light vanilla. This is my kind of Reposado, as this is like a buttery blanco, with light smoke, natural sweetness and light wood- Oh baby!! For a blanco lover....it doesn't get better than this. NOSE- cooked sweet agave, so buttery and full of minerals, clean, some anise (licorice), light smoke and a touch of alcohol. Light spice and honey, some light caramel and light butterscotch and maybe a pinch of cinnamon and mint. Fruity with a touch of orange, some light vanilla and a light oak/whiskey/bourbon presence. TASTE- thin to medium oils, soft and buttery, natural sweetness, light whiskey/oak presence, light vanilla, some some cinnamon and light spice, along with pepper and minerals. A nice pinch of citrus and dried fruit presence. A silky mouthfeel with light smoke and just a pinch of heat up front. FINISH- buttery, some light heat, a touch of smoke, light fruit, oak, and light spice and pepper, ending in a medium finish. ANEJO- At about $54.99 a bottle, doubled distilled and aged in 100% used American white Oak for 18- 36 months, again at the discretion of Master Distiller Sergio Cruz. Like the Reposado, Gran Dovejo Anejo is distilled to 49% abv/98 proof, then reduced with artisanal well water before aging. Balanced, with a definite oak/cognac/whiskey presence, there are plenty of barrel notes present in this dark and rich looking expression, and is very enjoyable to drink. This is very different from the 'blanco-like' buttery and smokey Reposado, but noticeably 'related' to this quality line of tequilas. This is a full bodied, rich and bold Anejo with aromas of sweet oak/whiskey, honey, spice, maybe a slight baking spice note, a light pinch of cherry, light smoke, caramel, vanilla and butterscotch. Tastes include honey, caramel, butterscotch, vanilla, and a sweet whiskey presence. This is the regular Anejo, as there is also a selection of cask strength single barrel Anejo made specifically for 'Bounty Hunter.' Salvador Chavez told me they have plans to release a 'non retailer' selected cask strength single barrel anejo, along with an Extra Anejo in early to mid 2018. It seems that K&L was the first retailer to select a Gran Dovejo single barrel Anejo (they are out of it now, and had 3 selections overall), but their selections were not cask strength, whereas Bounty Hunter's selection is a single barrel and bottled at cask strength. I can't wait for these new bad boys to hit the market, so stay tuned....I expect more greatness soon. NOSE- sweet cooked agave, definite whiskey/cognac/barrel oak notes, with vanilla, caramel, butterscotch and honey. Some spice, a pinch of orange citrus and fruit (cherry), with slight tobacco and roasted hazelnut presence, along with some alcohol. A fragrant floral-like presence with mild cinnamon and smoke. TASTE- medium oils, sweet whiskey/cognac taste, lots of oak barrel notes including caramel, vanilla and light butterscotch. Silky with some cinnamon, honey, maybe a pinch of clove, some fruit (orange), and light spice. Very smooth mouthfeel with some heat. FINISH- very smooth, honey, caramel, some spice, a little smoke, some butter, an oak/wood presence and sweet, with a slight alcohol tingle and ending in a medium to long finish.